I know it has been a few weeks since the last installment in this series, and with TechEd on the horizon it'll probably be a couple 'til the next, but as long as there is some time in between let's explore another area of performance optimization with the RadControls for ASP.NET AJAX. This week, we're going to take a look at HTTP compression and how this simple technique can deliver a valuable performance boost to your website. Since the turn of the century, almost all browsers have supported compressed content via the "content-encoding" (or "transfer-encoding") specs defined in HTML 1.1. When a browser requests a page from a server, it always tells the server if and what kind of content encoding it can handle. This information is communicated in the "accept-encoding" request header. If the server is configured correctly, it can respond to this header value and automatically compress (think Zip) the HTTP content before sending it to the browser. When the content arrives, the browser decompresses the content and renders the page. The overall goal of HTTP compression is to reduce the number of bytes that must be transmitted over the tubes between your server and the user's machine. Since transmission time is often the slowest bottleneck in loading a page, and since bandwidth directly relates to your costs as a site operator, reducing the bytes you transmit to the user can save you money and improve your site's performance. How do I use it with ASP.NET? Fortunately, there are alternatives for developers that want to deploy HTTP compression support with their applications (or for those devs that don't have access to IIS, such as in shared hosting environments). Several open source projects and commercial products exist on the interwebs that provide HttpModules to compress your content based on configuration rules. Once such commercial tool that I've used successfully in the past is ASPAccelerator.NET. By simply adding a HttpModule reference to my web.config and deploying a single assembly in my bin folder, I can instantly begin compressing my HTTP content (served by IIS6 or 7) based on an intelligent set of rules. For today's tests, that is the approach that will be used to compress our test site. And since we're interested in seeing how HTTP compression helps "real world" site performance, we're going to be doing our testing a little differently this week than we have in the past. Have you heard of Gomez? If you work for a large, Fortune 500 company chances are you are using their services to actively monitor and measure your company's web performance. Gomez is one of the largest providers of website performance measurement and tracking, and as such, they have some of the best tools available for measuring a site's performance. What you may not know is that Gomez provides a free "instant site test" that you can use to take one-off measurements of your site's performance as seen by one of Gomez's 12,000 test computers. The free service allows you to supply a URL and select a test city (L.A., New York, Chicago, Beijing, or London), and then Gomez generates a detailed report showing you how responsive your site is. This is a great (free) way to see the real world effects of latency and bandwidth on your site, which makes it a perfect way to measure the effects of HTTP compression on our test site. And to conduct today's tests, we'll be setting-down our fun InterWebs demo in favor of using the slightly bulkier Telerik Help Desk demo. This demo displays a fair amount of data pulled from a SQL Server 2005 database, and it uses many RadControls, such as RadGrid, RadTreeView, RadMenu, RadCombobox, RadSplitter, RadAjax, and RadCalendar. RadWindow and RadEditor are their, too, but they won't have an impact on today's tests of the primary Help Desk landing page. How will the tests be run? To conduct today's tests, we'll start applying the techniques we covered in parts 1 and 2 of this series to the Help Desk demo, collecting 5 Gomez test results from their Chicago test server (the demo today will be hosted on a DiscountASP server in California). All tests will be run as if on empty browser cache (thanks to Gomez) and the average of the 5 tests will be reported. Once we've layered-on our previous performance improving techniques, we'll enable HTTP compression with ASPAccelerator and see what kind performance benefit it provides. Make sense? Then let's run our tests and analyze the results. If you didn't believe the impact of leaving complication debug = true from part two of this series, believe it now. Simply setting debug to false reduced the time it took for our page to load by almost 30% (7 seconds)! ALWAYS set debug to false in production. The same advice is true for the RadManagers (RadStyleSheetManager and RadScriptManager). By simply adding these to my page (and doing nothing else), I further reduce page load time by over 50%. Combined with the first step, 60 seconds of work has shaved almost 70% of the loading time off of my page. Finally, adding the HTTP compression shaves another 30% off my page load time, producing a page that takes almost 80% less time to load than the original version! And I haven't changed any code. Just as important as page load time in today's tests is measuring how much HTTP compression saves me on total bandwidth. If there is anything in this largely free marketplace we call the Internet that increases our costs as our sites become more popular it's bandwidth (and the servers required to fill it, of course). So if HTTP compression- in combination with our other performance improving techniques- can reduce the bandwidth we consume to send the same pages to our users, we'll directly impact our bottom line. Let's see how bandwidth varied over each stage of our test: As you can see, HTTP compression had a huge effect on the number of bytes we needed to send over the line to load the same exact page. With no "treatments" applied, we sent over 1 MB of data to our user's browser on the first visit! That's a lot of data. Setting debug to false reduced our bandwidth usage by about 15%, and adding the RadManagers only slightly lowered bytes sent from there. When we added the HTTP compression, though, we reduced the number of bytes sent over the wire by over 75%! That's a huge bandwidth savings that should directly translate into higher throughput on on our servers and improved page response times. As with all performance tips, you do have to be smart in your application. While HTTP compression is generally a very efficient operation that doesn't significantly task the CPU, you should be careful on high volume sites. The extra CPU cycles required to perform the compression could make site performance worse than it would with compressed traffic. In most low- to medium-volume scenarios, though, you can compress without concern. In the coming weeks, I'll highlight a hardware solution that can solve the woes of compression on high-volume sites (in addition to providing a number of other helpful performance boosters). If you want to explore the tool on your own in the mean time, visit the Strangeloop AppScaler website. You also need to be careful with HTTP compression and Ajax. Some HTTP compression tools do not play nice with Ajax requests, breaking callback functionality on the page. ASPAccellerator provides support for the ASP.NET AJAX framework, but not all tools may be as helpful. Choose wisely. The rules from parts 1 and 2 of this series are still among the most important for improving page performance. 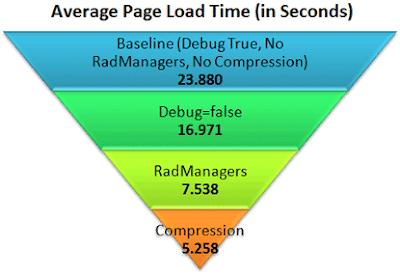 Adding HTTP compression to your page with the RadControls for ASP.NET AJAX can measurably improve page performance and significantly lower bandwidth requirements. Hopefully these tests help you understand and visualize the benefit HTTP compression can play in squeezing every bit of performance out of your site. In the coming weeks, I'll try to do some comparison tests of different HTTP compression methods- IIS 6/7, port80, ASPAccelerator, open source- to give you more guidance if you're trying choose a compression provider. Until then, compress away and do your part to help reduce the bits clogging the Internet's tubes! I also highly recommend Port 80 Software if you are using Windows 2003 servers. Their software just bolts in to IIS so you don't have to change your applications. True, but it does require you to have access to the server to install it. For many -devs- that's not an option. For small shops, they may be using shared hosting and not have the option of installing software. For enterprise shops, devs usually have little control over the server environment and have to fill-out stacks of paperwork to install software in a production environment. For those reasons, I chose to highlight a bin deployable solution. I will, however, try to spend some time comparing the effectiveness of the bin deployable solutions to products like port80 and IIS7 compression so devs can make the right choice for their org. Thanks for the feedback. It's a good data point. What the Port 80 software does is modify IIS's metabase. IIS6 already comes with very good gzip compression. In fact it's so good that Port80 recommends it over their own (for IIS6 i.e., not IIS5). There are instructions out there that guide you through the process of enabling compression in IIS6; nothing to install on the server, it's there you just need to enable it. Of course this won't work for shared servers, but if the shared service doesn't offer this I would probably go somewhere else. The built-in compression (when set to "9" not "10 -- which is the max) is very fast and hardly noticeable on the CPU. Any add-on to a .NET application will be most likely be slower than the built-in method. 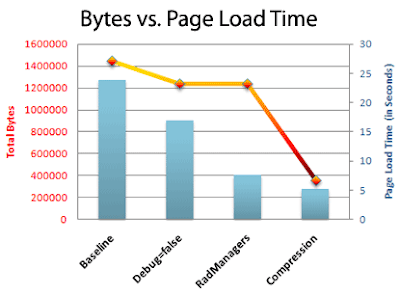 Well, the point remains: HTTP compression- no matter how you implement it- does have a measurable impact on improving page load time and saving you a lot of bandwidth. "Microsoft JScript runtime error: 'RadControlsNamespace' is undefined"
You have a dead link on here, it goes to a yellow screen of death. The horror! plentyoffish.com is probably the most amazing use of gzip - 2 web servers, 50k concurrent users. Pageflakes is another, you just cant have high traffic, highly performant sites without gzipping. Great article. I have looked around for different solutions, both open source and paid ones. Some of them also do what RadStyleSheetManager and RadScriptManager does - and some do not work well with AJAX controls, so I am curious to hear which work best with RadControls for AJAX. Did you have the opportunity to do some tests as "promised"? The best solution would be that Telerik includes a RadHttpCompressionManager in their suite that works optimally with the controls. @Kasper- Ask and you shall receive! :) Telerik will be introducing a new compression module in an upcoming release of the RadControls (not sure if it'll be SP2 or Q1) that will help. It won't necessarily be as "full featured" as some of the other dedicated compression vendors, but what it will do is focus on one of the key areas that needs compression in a ASPNET app: ViewState. Watch for more details soon. Sometimes i believe that just saying that HTTP compression will be the silver bullet is mistake, When Taking HTTP compression into consideration, The Execution time on the server will increase, so as the Browser time for decompressing the packets, So sometimes you might get the same results because the amount of time reduced from the network traffic will be added to the Compression and Decompression time on the server and client, you might instrument that by enabling trace and taking a look at the Server Response time. More over, Handling Very Complicated Telerik Rad Manager controls to be updated (e.g 100 controls per request), will dramitcally maximize the server and client times. What you are speaking about would be very nice in pages that don't cross the 400 KB boundary, but if the page and its data crossed the 1 MB, You will never get the 75% Performance reduction . @Latief- You are correct. There is no "silver bullet" for fixing performance problems. There are just techniques, all of which may or may not be appropriate for your site. Here, I'm hoping to highlight those techniques and highlight their -potential- impact on your site's performance. There are definitely scenarios- such as you've described- where the benefits would start to diminish due to higher processing times on the server or client. Hopefully, though, the overall ideas will help you think critically about ways to optimize your site performance. Hope that helps.